The Thorne Rooms were developed in the 1930s and 40s by Mrs. James Ward Thorne, Chicago, IL, who loved dollhouses as a child. 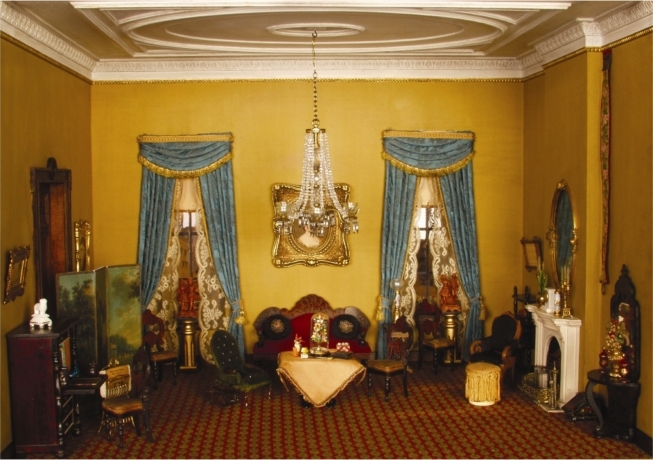 After extensive travels in Europe where she collected miniature furniture and accessories, Mrs. Thorne had over two dozen miniature rooms created by cabinetmakers from her own drawings. They were made in a scale of one inch to one foot. She painted and stained woodwork, papered walls, and made textiles for the rooms. The rooms were displayed in several World’s Fairs. In 1933–1934 they were displayed at Chicago’s Century of Progress Exposition. In 1939, they traveled to San Francisco’s Golden Gate International Exposition, and in 1940 they were displayed at the New York World’s Fair. Later, Mrs. Thorne created 29 more rooms, copying Europe’s castles, museums, and historic homes. She commissioned architects to create historically accurate settings and had textiles and carpets made by the Needlework Guild of Chicago. The rooms, tracing English and French style 1500–1920, were exhibited in 1937 at the Art Institute of Chicago. In 1942, Mrs. Thorne gave a third and final group of Thorne Rooms to the Art Institute. Those 37 rooms offered a view of American History, 1675–1940. In 1962, IBM, which had purchased 29 rooms, gave nine of the original Thorne Rooms to Knoxville’s Dulin Gallery of Art, this museum’s predecessor. Our rooms contain many of the miniature objects Mrs. Thorne collected during her youth and on her travels. The Knoxville Museum of Art is one of five museums in the country to have a collection of Thorne Rooms. KMA’s Thorne Rooms are historically important not only as vivid records of period settings, but also as some of Thorne’s earliest works.